THE EVENT: Come enjoy an incredible fundraiser night! This fun, lively, and casual event features a sampling of hearty appetizers from around the world. Food will be set up at serving stations and you can visit the stations as many times as you like – in this way, it very much fits the Montessori model! It is not a “sit down” dinner and you get to decide your own plates and experience. The Oneota Golf & Country Club bartenders will offer drinks for purchase to complement your tasting adventure. A silent auction will also be part of the excitement of the evening, featuring local wares and packages to the highest bidder. All proceeds from the event benefit NEIM! THE HISTORY: Around the World in 5 Plates is how NEIM pays homage to Maria Montessori and her extensive work with education, hope for peace and her involvement with the United Nations. Dr. Maria Montessori opened the first Montessori school 1907. As a scientist, educator, and physician, she supported the work of the League of Nations and its successor the United Nations as a forum where peace could be created. 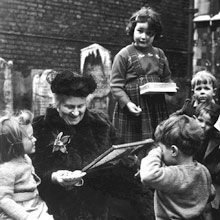 Maria Montessori formed the Social Party of the Child in Copenhagen, 1937 and worked tirelessly in support of the Rights of the Child in conjunction with UNESCO. Dr. Montessori saw the hope for peace in the education of children. That foundation is laid in Montessori schools, as children become independent, self-actualized and compassionate community members. They learn to collaborate as active agents of social evolution. The curriculum for peace education like all subjects is determined by the developmental characteristics of the child. Because the elementary student is in a sensitive period for reason, justice and morality, the Model UN Program forms a part of the Science of Peace that Maria Montessori believed was the real answer to war and conflict. Currently, more than 200,000 high school and university students participate annually in the Model United Nations Program.